When designing a barn with living quarters, you want to highlight the unique features that are already present in the barn. Your design should highlight and support the existing structure. There’s a balance between updated home design and rustic barn features that you have to find. This post will take you through your barn apartment room by room. A barn is known for the communal and warm feeling it gives off. If you’re designing a barn with living quarters, your kitchen is the perfect way to incorporate this communal feeling. Just like any other home, your kitchen is the gathering point for friends and family. Don’t think your welcoming kitchen needs to be limited by a smaller apartment. 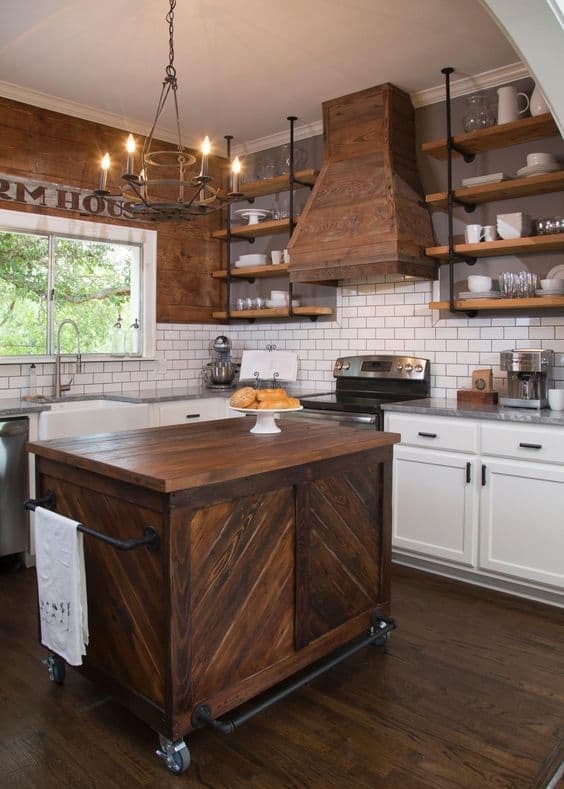 These design ideas can help you create the communal kitchen of your barndominium dreams. All wood interiors are a classic characteristic of barns. Keep this aesthetic in your kitchen with wood paneled walls. To bring this wall treatment into different aesthetics you can use different finishes on the panels. For the classic rustic feel, use a stain that brings out the natural warmth in wood tones. If you want a more modern take, white washing wood brightens the room. Backsplashes are a common feature in kitchens. Keep it simple with subway tiles for a clean look. They are available in a range of colors and can complement your wood panels, rather than distract from them. A lot of your barn kitchen furnishings will depend on the size of your space. Counters and cabinetry help to define your space and give it a solid design direction. If you have the space for a full size kitchen, warp around counters provide plenty of surface space. When paired with cabinets or under counter appliances, you can maximize the efficiency of your space. If space is limited, or you want an alternative to a classic farm table, a central island is a good choice. It creates a central gathering point in your kitchen and highlights the communal nature of the room. Your countertop can bring a new edge to your kitchen’s aesthetics. Like farmhouse kitchens, butcher block and soapstone are the most common materials for barn apartment countertops. They both offer low maintenance solutions that have a range of colors and styles. Farmhouse sinks are another major way to add the classic country charm to your kitchen. The apron front is a traditional design for a rustic kitchen. Different décor accents can add a unique touch to your barn living quarters. Simple changes to pieces in your space can add major design. If you have a pantry or kitchen closet, consider replacing the door with a sliding barn door. Not only does it pull the classic barn aesthetic into your renovated space, but it can also save space. You won’t have to make space accommodations for a door to swing out, but rather just a clear path along the door’s track. Chalkboard surfaces have become very trendy recently, particularly in rustic spaces. If you won’t want to commit to a full chalkboard wall panel, you can use chalkboard paint and create your own DIY sign. The ability to have handwritten art on your kitchen surfaces adds a homemade charm to the room that you can’t find with premade stock pieces. Continue the rustic DIY theme with your light fixtures! Use mason jars to create a hanging pendant light fixture. It pulls in the rustic country charm into your barn’s living quarters. Barns with living quarters often take advantage of an open floor plan to maximize the space of the second floor. By connecting the living room and kitchen and eliminating extra walls, the space feels larger and has better airflow. The design of the living room should fit into the rustic design aesthetic that you created with your classic kitchen design. Barns have unique architecture that makes them beautiful living spaces. Barns with apartments often take advantage of the vaulted ceilings and large walls by making them the focus point of the space. If your barn already has exposed support beams in the ceilings, leave them uncovered and let them add character to the space. If there are no exposed supports, use reclaimed barn wood to create them and add them into the frame of your ceiling. This draws the eye upward and makes the space feel larger. This is perfect for barn apartments that may be tight on space. The large walls should be treated subtly. Because of their height and massive length, a busy wall treatment can quickly feel stifling and overwhelming. A good way to accentuate the walls without overdesigning them is to continue the wood paneling that you began in the kitchen. This keeps the space’s originality intact while also adding a finished edge to them. When you’re furnishing your barn living room, keep your colors limited to neutrals that will compliment your rustic décor. Dark colors can make the room feel heavy if used in excess. If you want the rich tones of a dark brown leather, use it in only one piece of furniture. This could be an overstuffed couch, armchair, or quilted ottoman. Sectional sofas are a popular option for open spaces. Not only do they provide a lot of seating, but the L shape helps to close off the space without using an actual barrier. Compliment your couches with reclaimed wood furniture. Popular all wood furniture items include coffee tables and entertainment centers. These large pieces are central focuses that are simple in design but interesting because of the materials used. One of the most important things that you can add to your barn with living quarters is a ceiling fan. Hot air rises and with a barn, your second floor can get hot fast, particularly during the summer. Air conditioning units are always a good idea, but ceiling fans can cut back on costs while also adding the room’s décor. One unique ceiling fan design that fits into a rustic décor perfectly is a repurposed windmill. The metal frame is a great accent to the natural wood walls and ceiling. If you want to add some storage into your living room, storage trunks are a popular option. These old pieces are a natural fit into a rustic and homey décor, but can also provide storage for extra blankets. If the top is flat enough, you can use them as a side table as well. A cozy bedroom fits well into the rustic décor of a barn with living quarters. Whether you like your bedroom to be full of light and airy or you like rich colors with deep tones that make you want to curl up in bed, a barn bedroom is for you. Depending upon what materials you use, you can create your ideal space. You can use different materials in the basic design of your room to achieve different aesthetics. The common thread between both is the wood paneling that has been common throughout the barn apartment thus far. If you like a light and open space, white wood panels can be added to your walls for a ship’s lap effect. The white will reflect any light coming into the space making it feel bigger and brighter. White wash wood is also a great option for your floor. The grey tone adds depth to the room, but it’s still light enough to keep it open. Vaulted ceilings open up the space further. If you’re goal is to create a bright open space, focus on using lighter colors in your furnishings. Off whites and pastel blues are popular options for textiles used in this space. The key is to use muted tones that aren’t going to overpower any serenity that you’ve created with your light color walls and floors. You can incorporate visual interest by using smaller patterns that feature tone on tone colors. Darker rooms that exude comfort feature dark charcoals and darker taupe tones. These colors don’t overwhelm the space, but add a layer of comfort that you may not find in lighter color families. Thick knit blankets can add texture to your bed. No matter which design aesthetic you choose, your bedframe will probably be one of three options: all wood, metal, or an upholstered piece. All wood headboards can be made from pallets as a DIY project or simply attached different wood panels together to create the headboard. You can finish the wood to match the rest of your décor. If you want to add an industrial touch to your rustic home design, you can use a metal bed frame. Usually made from repurposed pipes, you can get them in either a metallic silver or a black color. The silver pipes are perfect for your bright bedroom and the black frame caters to the darker colors used for the other design. For a luxurious feeling, a quilted upholstered headboard can fit into any home design. You can change the fabric based on what look you’re wanting to achieve. Lighting is one of the key features of any room. In your bedroom, you want to create a relaxing ambiance with your light. If you want a softer lighting option than a standard lamp or ceiling light fixture, string lights are the perfect solution. They create a glow rather than a beam of light. They also have the flexibility to be strung anywhere in the room. If you want your room to feel bigger, a large mirror is an easy way to extend the space. The reflection helps the room to feel longer. Just because your bathroom will have more moisture than other rooms in your barn doesn’t mean you have to give up the rustic aesthetic. There are plenty of ways to create a consistent home design in the bathroom without giving up practicality of the materials. The obvious material option for a bathroom is tile. You don’t have to use boring square acrylic tiles that will interrupt your otherwise trendy barn space. Subway tiles are a great way to have waterproof walls without being dated. 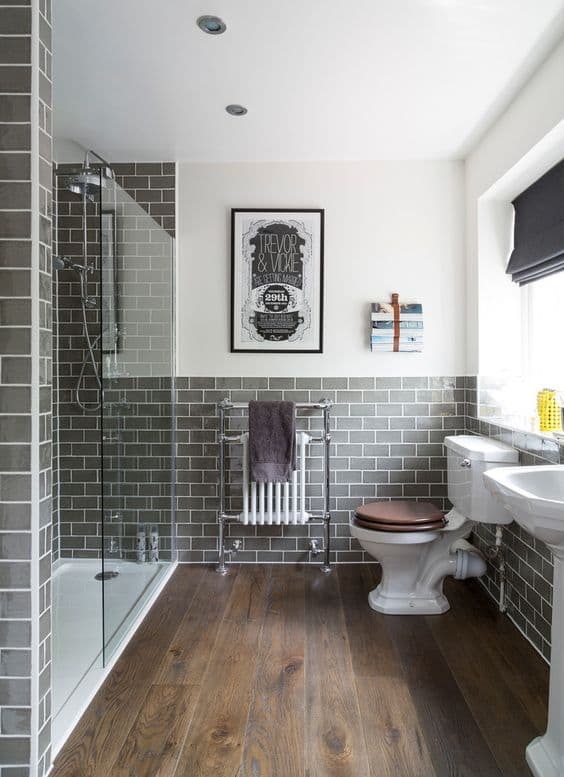 Most rustic bathrooms feature either all black or white subway tiles. If you to keep tiles floors, you can use hexagon tiles to create an interesting pattern in your floor. If you want to keep wood as a common material throughout the entire barn living quarters, you can use wood paneling on the walls that aren’t up against the shower. You can also have wood floors despite the extra moisture. You will simply need to treat them a little differently with extra varnish. You’ll also have to be careful not to let standing water sit on your wood floors too long. Whether you have a shower, tub, or both is the largest factor in your bathroom design. It defines the rest of the space around it. You can redesign your shower stall to fit into a new design aesthetic. Most showers have all glass doors with some sort of fogged glass effect. You can replace your plain glass doors with a more stylized design. You can install a glass door with a window pane frame for a more modern design. If you have a stand alone tub, you can create privacy by installing the bathtub in a small nook. A sliding barn door can close off the space from the rest of the bathroom. If you’re looking for a rustic storage solution that will also add to your décor, floating shelves are your solution. Use dark wood to add depth to white tile. Floating shelves can hold extra hand towels or other knick-knacks that you may keep in the bathroom. If you don’t want to leave items out in the open on the shelves, galvanized buckets are a solid container that fit into the rustic décor, particularly when mixed with all wood shelves. One unique part of a barn’s architecture is the loft. Almost every barn has one and it’s a space that holds a lot of potential. Most barns with apartments keep the loft in its all wood form and simply finish the wood to make it into a living space. The most basic design is going to be a storage loft. This is an easy use for the loft that provides you with some storage space that is close by, but out of the way from your common living areas. 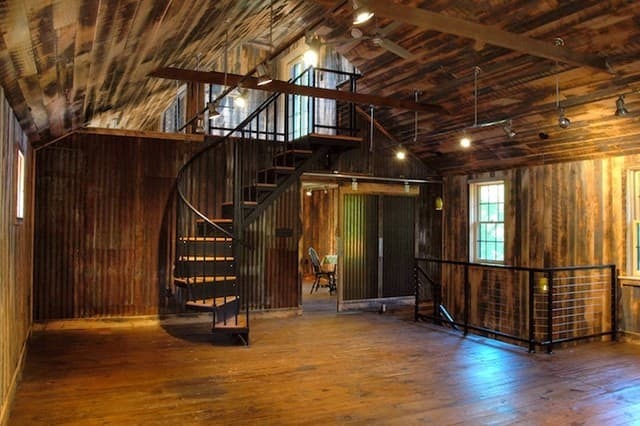 It acts as a stand in for an attic or basement that you don’t typically find in a barn design. 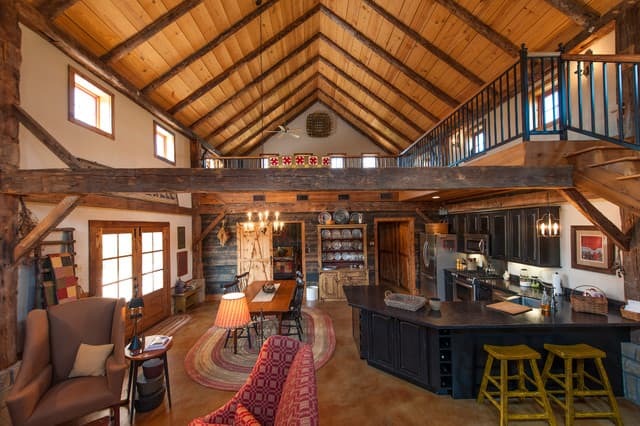 Some original loft designs feature a full wall separating it from the rest of the barn. You can choose to keep this wall and renovate your loft to add an interior wall and connect it with the rest of the space. You can also knock this wall down and install a railing instead to keep the space completely open. Your loft will also be the highest point of your barn, meaning you get the architectural interest of the slanted ceiling, but it will also be the hottest room. Having a functioning window in this room is important for ventilation and the comfort of anyone using the loft. 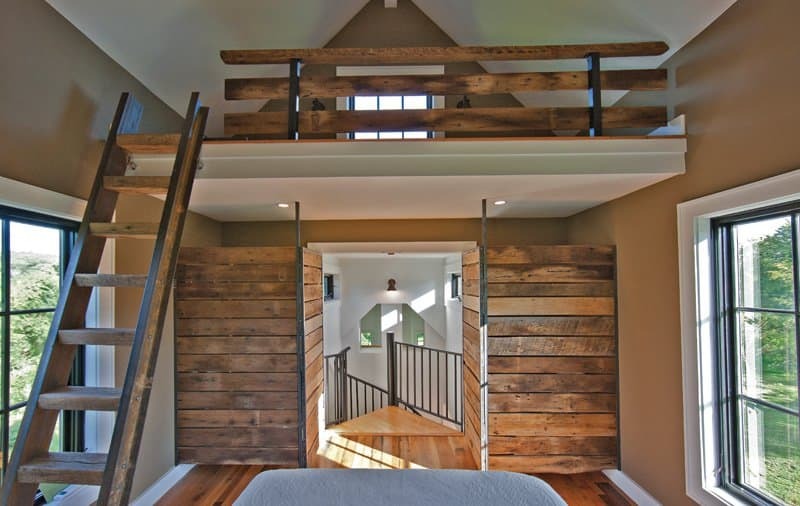 The last key design feature of a barn loft is how you access the space. When the loft was simply used for hay, a ladder was a practical option. However, now that it’s a barn with living quarters and the loft will be used regularly, you’ll probably want a more stable option. Spiral stairs are designed to give you the stability and walking path of a traditional staircase with the small footprint of a ladder. Barn lofts are typically found at the back of the building. A spiral staircase can easily fit into this space without taking up a large amount of space in the living quarters. Keep your rustic aesthetic by choosing a Classic Steel spiral stair and pair it with wood treads that can be finished to match the rest of your space. If you plan to renovate a barn with living quarters, there are so many things to consider. Between keeping the structure’s original design and incorporating new design elements, it can get overwhelming. Take it room by room and you’ll have a brand new living space with all of the rustic charm before you know it. If you want to start your own renovation with a new spiral stair, call one of our consultative designers today at 1-800-368-8280. They can help you design the perfect stair for your space.